Sleepily down Church Road I walked, past an unmarked dirt lane traveled most often by farmers on tractors. Somehow I had tumbled out of bed and out the door. I would much rather have continued my slumber under warm covers. Crisp darkness and the ripe fragrance of dew upon cut hay greeted me as I stepped onto the covered porch. I could see only silhouettes in the lingering darkness: old trees planted by farmers perhaps a century ago; the Oquirrh mountain range; cattle chewing mechanically on coarse grass. I blamed my wife. It was because of her that I began to walk on Rabbit Lane. Early the next morning I arose, quietly, so as not to awaken her, not out of consideration so much as pride, out of not wanting her to know that she had motivated me to escape the perpetual pull of sleep, to move beyond my miserable comfort. As yet I was unwilling to confess it. I walked toward the highway, the dog baying at my back, begging me to take him along. No, Tank. This is for me. Sensing my resolve, he set to a mournful howling, like a lonely wolf under a full moon. I shuddered at the neighbors’ unheard curses. Past Harvey’s log-clad trailer I lumbered, past Ron’s house dressed shabbily in fake brick-red asphalt shingling, past Shirley’s once-neat bungalow with peeling white paint and rotting wood soffit, past Lucille’s brown two-room clapboard shack with the outhouse thirty feet from the front door. Past fields of golden oats and purple-flowered alfalfa ready to cut, dry, bail, and stack. Directly above the entrance to an unremarkable dirt road, leaves suddenly rustled high in a Cottonwood tree, as if from the sharp release of a branch pulled back taut. I looked quickly up to see the gray shape of a great owl flying powerfully with wide, deep wing beats, but making no sound at all in its flight. It screeched suddenly, high and hoarse, as if to say, How ignorantly you interrupt my repose! The owl flew eastward toward the mountains, behind which a faint pink light steadily grew in anticipation of sunrise. My encounter with the owl felt personal, even miraculous, as if a gentle reward from some nature-spirit pleased that I had summoned the strength to venture forth into her marvelous but fleeting realm of early morning stillness. The soft lowing of cattle began to give way to an irksome highway hum that grew to a buzz, and, as I approached the intersection, to a morning rush-hour roar that pressed against me as if it were the gale of a howling hurricane. Reaching the highway, I turned and recoiled as the force of the terrific noise pushed me away, back to the interior of the farmland. This hurried human commotion had quickly usurped the magical peace of my meeting the owl, had compelled me to reverse course and walk toward home, my back to the noisy artery. I determined never to approach the intersection on foot again. Half-a-mile from the highway, I began to hear again the faint sounds of water trickling idly through an irrigation ditch. In the new light of morning, a muskrat splashed its startling alarm and dove to streak back to its burrow in the bank. Here, at the ditch, begins Rabbit Lane, a narrow dirt road that follows the natural terrain between farms. Rabbit Lane marks the county’s zero longitude line on the Salt Lake Base and Meridian survey system: everything east is east; everything west is west. 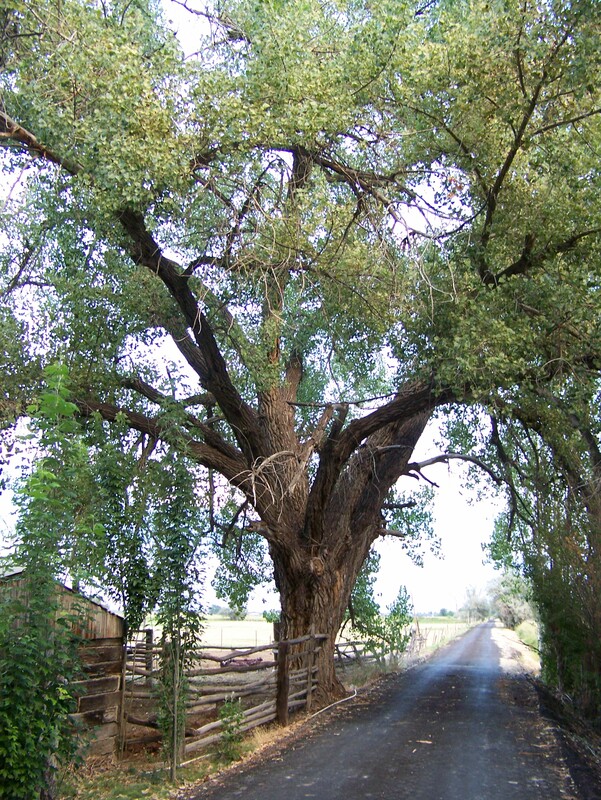 Ancient cottonwood trees form a shaded canopy where the road begins, like the shrouded entrance to a magical green world. The irrigation ditch, overgrown with Cattail reeds, Watercress, and Russian Olive trees, follows along one side of the lane. Pink-blossomed Milkweed lines the road edges where the county grader has pushed up a slight berm. Repelled by the memory of the highway’s howl, I turned north onto the hard-packed dirt, and found myself forever changed. This entry was posted in Awakening, Contemplation, Enlightenment, Memoir, Nature, Walking and tagged Country Road, Farm Country, walking on September 27, 2014 by Roger Baker-Utah. I can tell that I am really going to enjoy reading your stories. You have a definite talent of bringing your words to life and making me feel as though I am right there walking with you. It definitely brings back some memories that were almost forgotten. Not that it matters ..(because it doesn’t )..My “log clad trailer” really wasn’t a trailer, it is the other half of my brother Cloyd’s house across the street that my Dad and Grandpa Rimington moved there from a small town that used to be called Garfield that was just west of where the Anaconda Smelters smokestack is now. They paid 50 bucks a piece for the two box like shacks 20 ft wide and 50 ft. long. Dad and Grandpa gutted them out and remodeled them. I moved from Tooele to this home in 1956 soon after marrying at the age of barely 18. If you don’t mind and if I am able I would like to forward your stories to my kids. When we get together on occasions we always have to talk about Erda and the good old days. Thanks Roger, You have been a great neighbor and good friend. I doubt that your family remembers me after all this time but tell them howdy from me if you would….And Sue too! Oh P.S. I’m not sure I heard correctly our telephone conversations .My hearing hasn’t improved a bit since we saw each other back in 2000.and last Nov. So in case I didn’t come up with the right answer maybe that is why…:). What a great talent for words and creating mental images. It is an inspiration to this all-too-busy life traveler. Thanks for your effort and for sharing. Thanks for reading, Conrad. I will post a new chapter of my book every week. Enjoy! I finally made the time to start reading your piece, Roger. I can already tell I’m going to enjoy this journey down Rabbit Lane with you. Thanks for the invitation. Welcome! I really hope you do enjoy it. This is amazing. You are a wonderful story teller. I grew up on a dirt road and never realized how lucky I was until I moved away. I am looking forward to hearing more . I am a teacher and have the summer off. I will very much enjoy reading your memoirs this summer. Well Done. Thank you so much! I am so glad you enjoyed the first couple of chapters. Writing this book was a true meditation. My goal this year is to see the book in print. For now, I’m just happy when people enjoy it. Thanks again.